ANSORP has been successfully performing multinational projects on surveillance of antimicrobial resistance in major pathogens in Asian countries since 1996 with many publications in the international scientific journals. Through these actives, ANSORP will certainly contribute to the future control strategies of resistance problem in the Asia Pacific region. We have strengthen partnerships with international bodies including WHO and the Asia-Pacific Economic Cooperation (APEC) for combating antimicrobial resistance (AMR). 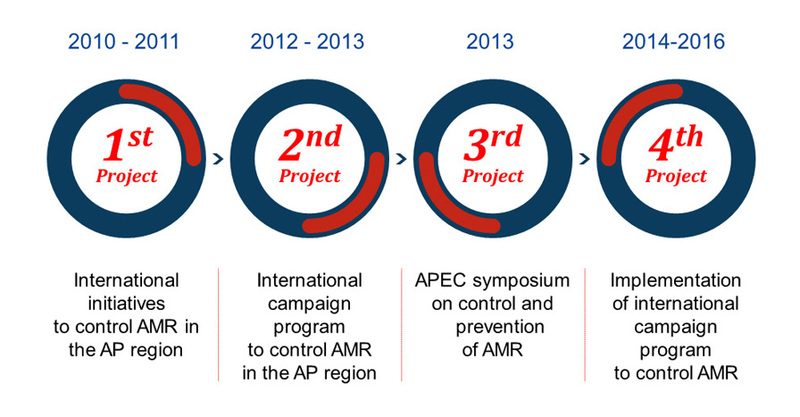 APEC supported our serial projects to set up the future strategies to control and prevent AMR in the region since 2010, including the project to develop international campaign program to control and prevent AMR. In 2014, based on the serial projects on AMR, we developed the “APEC guidelines to tackle AMR in the AP region”, which was endorsed by APEC.